Walk at Lunch with SONE and Blue Cross Blue Shield of NE! 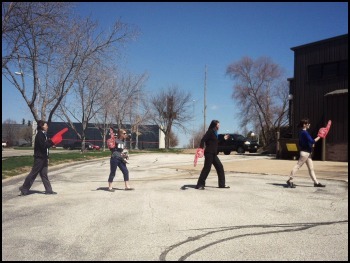 From Blue Cross Blue Shield of Nebraska: "National Walk at Lunch Day is off to a great start! So far, 90 Nebraska companies and 30 schools have signed up for Blue Cross and Blue Shield of Nebraska’s (BCBSNE) 8th annual Walk at Lunch Day, April 30—contributing to the goal of a healthier Nebraska and helping two healthy living causes in the process. For every company or organization that signs up for this year’s Walk, BCBSNE will donate $20 to support the Nebraska Game and Parks Foundation and Special Olympics Nebraska. Special Olympics Nebraska is a nonprofit organization that impacts special needs children through the power of sport. Donations to the Nebraska Game and Parks Foundation will be designated for the development and improvement of the statewide hiking and biking trail system. The $8,000 generated last year for Game and Parks has led to the construction this spring of new trails at Platte River State Park. If your company or school hasn’t registered yet, we encourage you to begin planning for the Walk and sign up over the next several weeks at www.nebraskablue.com. Questions? Contact Nate Odgaard at nathan.odgaard@nebraskablue.com or (402) 982-6528.